How Do You Know When It Is Time To Sell? Mine went last night. Fed up with :Weather. :Storage (at parents house) :After an hour i'm bored! :More crap weather. Fancy an Elise or VX220 now. Bit more practical imo. Sorry Geoff. Will ring you tomorrow if ok? Someone else had first dibs,came to see it this weekend and left it at that. Did you sell yours? It's bl**** quiet in here!! As above.Might be losing my parent's garage soon and i need to get back on the property ladder. 1999 "T" Seiw Zetec. Black with chrome pack 2ltr silvertop on twin webers 45's and trumpets. Alpha Weber brain. 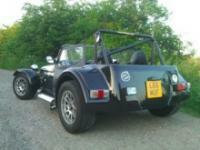 Mt75 with quick shift RAC rollbar Caterham R500 rear lights Contoured dash and sports seats fully carpeted throughout. Willwood powerlite front brakes/braided hoses etc. Full recent Gaz alloy coilovers and new springs. Pro race 1.2's with R888's 13 inches. Taxed and Moted Massive history file from day 1. Sidescreens and detacher-able momo steering wheel etc. Probably missed a load of stuff etc. WP_001349 by h4muf, on Flickr WP_001352 by h4muf, on Flickr Located in derbyshire. This car has been my life for the last three years. £7200. Swop my westy and cash? Hello! Been in the garage tonight,put battery back on as it's been stood since October. Checked all fluids and fired it up. After ten minutes found a bit of water under the car.Antifreeze Had my dinner whilst it got up to temp,no more leakage from anywhere and everythings dry.Fan kicked in so i knocked it off. Do i need to be worried? Zetec with ducted nose. P.s Bottom of rad looked ok=ish. Thanks. Why's My Internet Explorer Changed? Google chrome,it;s like going from a moggy thou to a 335i ! I could do with the rear finisher strip behind the seats if you have one? Ta,when do you usually recieve the mag? Hi,as above .Have you sent them out yet? As i am a bit paranoid the've gone to my old adress. Cheers. Lee. Cheers. My new address request fell on deaf ears. Hi,i moved house last march and haven't had a westfield world since then However,since the new forum came out and stating my new address,do you think i may start recevicing some issues? Thanks Lee. Buying A Westy - Where Do You Look?